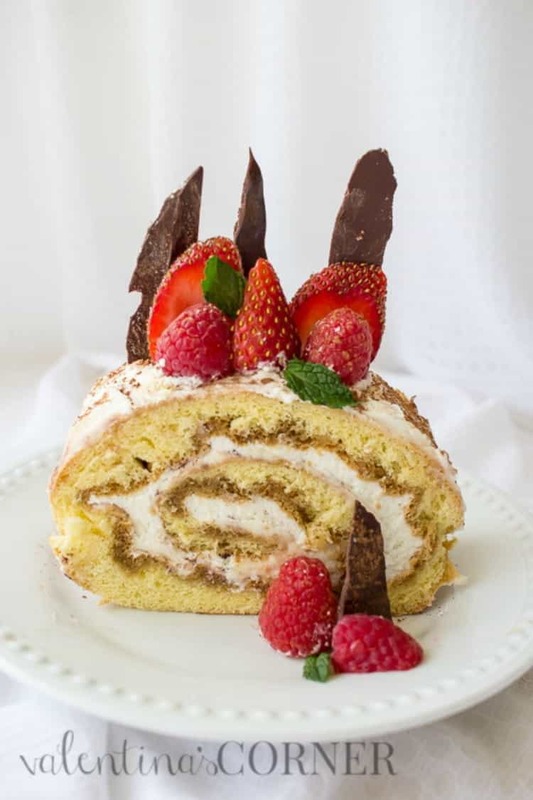 Berries Tiramisu Cake Roulade Recipe. 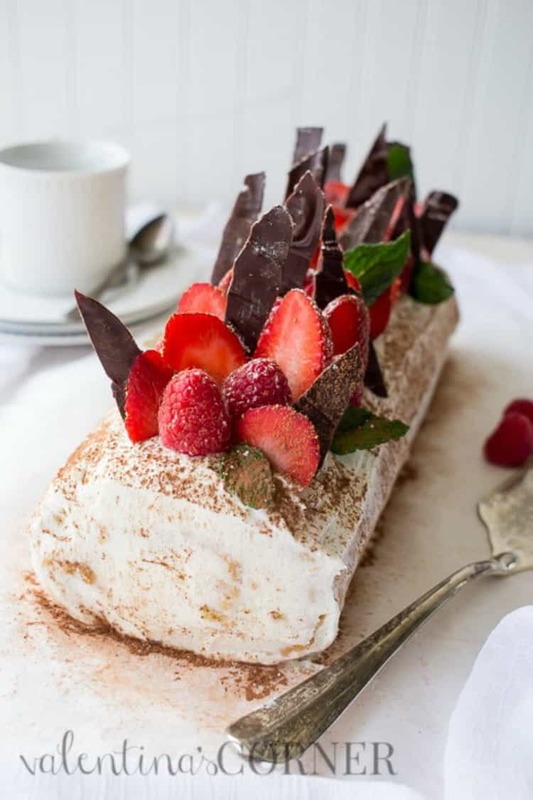 An amazing roulade recipe for the classic Tiramisu Cake soaked in coffee with mascarpone cream and fresh berries. This roulade is so easy to make, is so appealing and absolutely delicious. Enjoy this short video! Don’t forget to like our FACEBOOK page so you can save and share the video! We so appreciate it. The classic Tiramisu cake is a dessert originating from Italy. It is made with ladyfingers dipped in coffee and layered with a mascarpone cream and dusted with cocoa. This roulade is a homemade twist on the classic dessert. It uses a delicate and airy sponge cake and rolled into a roulade, with the mascarpone cream and topped with fresh berries. This roulade uses the classic sponge cake as a base for the cake. The only difference is that it’s baked and rolled as a roulade instead of a layered cake. Separate egg whites from egg yolks. Beat egg whites on high speed for about 2 minutes. Continue beating, slowly add sugar and beat another 2 minutes until stiff peaks form. In a separate bowl, beat egg yolks and sour cream. Add yolk mixture to the egg whites and give a quick mix. Stir in the flour. TIP: With the spatula, fold the mixture from the bottom up to be sure all of the flour is well incorporated. Add batter to a 12″x17″ rimmed baking sheet and bake. Roll up roulade. Allow the roulade to cool completely. In a medium bowl, beat mascarpone, vanilla and sugar. In a separate bowl, beat the heavy whipping cream. Add the heavy whipping cream to the mascarpone and mix. Spread 2/3 of the cream over the cake. Dust with cocoa. Generously coat tops and side of roulade with the remaining cream. Add your favorite berries! We used raspberries, strawberries and blueberries. If desired, add chocolate chunks as decor, optional. Can the Tiramisu Cake be made in advance? Yes, this tiramisu roulade may be prepared the night before. Add the fruits before serving. If you happen to make this cake or any other recipe of mine, I’d love to see your creations. Tag Valentina’s Corner on Facebook & Instagram, #ValentinasCorner. 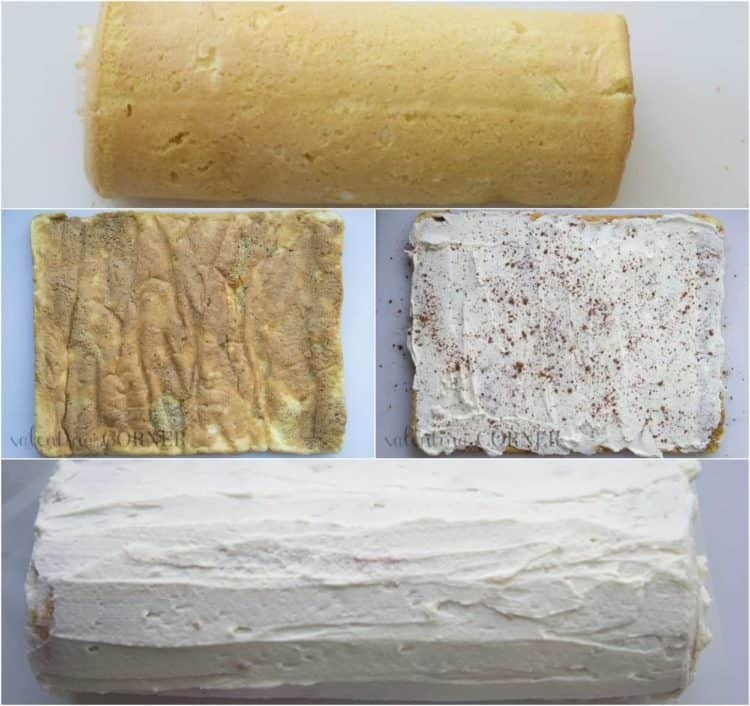 Tools used to make this Tiramisu Roulade: sieve, baking sheet, hand mixer, and spatula. Poppy Seed Roulade– Delicious poppyseed roulade with a dulce de leche cream. Coconut Almond Cake Roll Recipe– The best swiss roll recipe. Chocolate Layered Cake with Strawberries– An amazing chocolate cake! 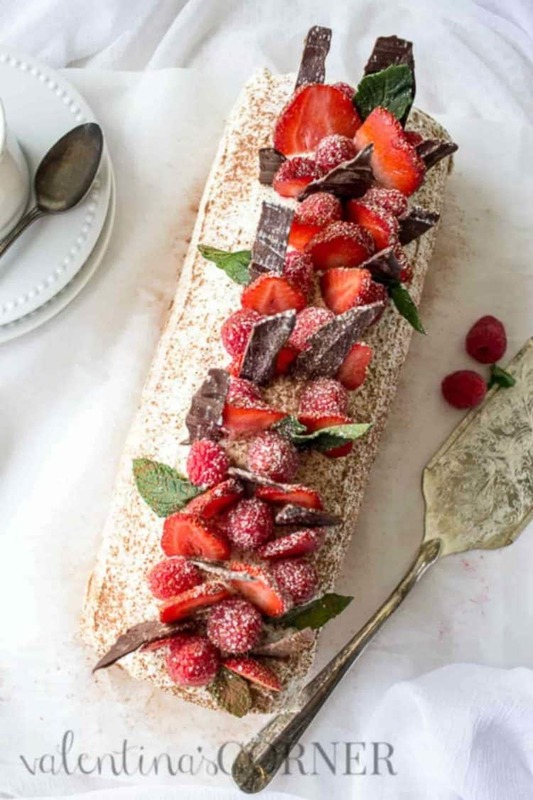 Berries Tiramisu Cake Roulade Recipe. An amazing roulade recipe for the classic Tiramisu Cake soaked in coffee with a mascarpone cream and fresh berries. 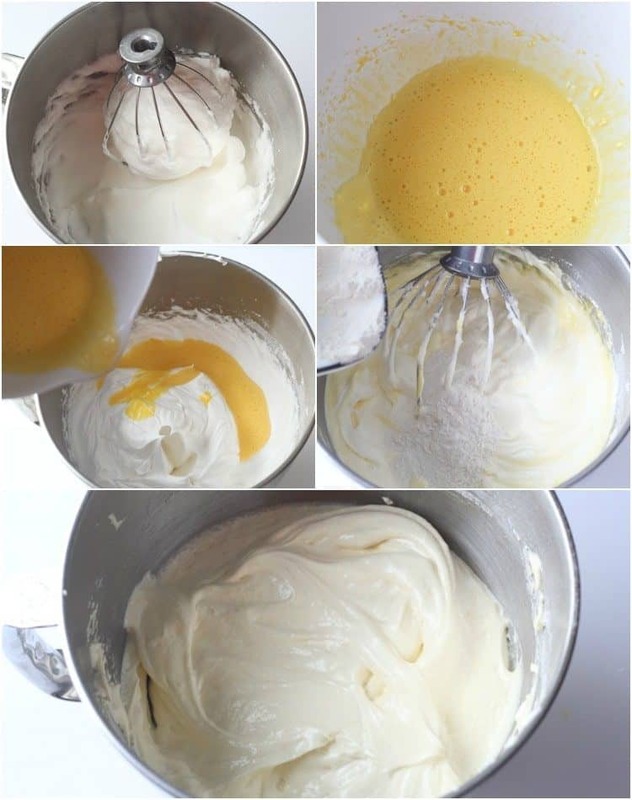 Separate egg whites from egg yolks. Beat egg whites on high speed for 2. Continue beating and slowly add sugar. Beat another 2 minutes, until stiff peaks form. In a separate bowl, beat egg yolks and sour cream. Add yolk mixture to egg whites and mix on low speed to combine. In a small bowl, combine flour and baking powder. Add the flour to the batter. Mix on low speed for a few seconds. Turn of the mixer. With a spatula continue folding the batter until well incorporated. Pour batter into the baking sheet. Bake 12-14 minutes. Once baked, let cool about a minute. With a sharp knife, release edges of cake from baking sheet. 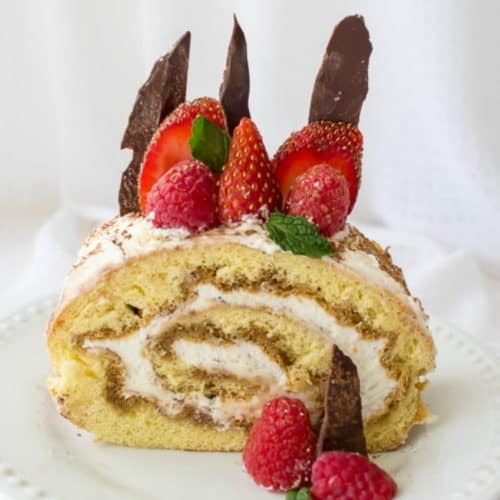 Roll cake into a roulade. Set aside to completely cool. Meanwhile, prepare cream. Beat mascarpone, vanilla and powdered sugar until well incorporated. In a separate bowl, beat the heavy whipping cream until whipped. Add whipping cream to the mascarpone, mix. Refrigerate until needed. Slowly unroll roulade. Brush roulade with coffee. Spread about 2/3rd of the cream. Dust lightly with cocoa powder. Slowly roll roulade back up. Refrigerate for at least 2 hours. Enjoy. I made it for my birthday and absolutely loved it. Now, I want to make it as a cake would you be able to help me with proportions? Hi Irinka! First off, Happy birthday, wishing you all of God’s abundant blessings. Stephanie, thanks for the wonderful feedback. So glad to hear your family enjoyed this!! ☺ Coffee and I have a special bond so this is a fav of mine ??.. I’ve make this cake roll 4 times and it never gets old!! Everyone eats it all up! I made this cake and it’s delicious? Yours Looks beautiful! Thank you for the wonderful recipe? This looks perfect and I want to try this version as I love both fruits and tiramisu. As an alternative, do you think I could substitute strawberry jam instead of the coffee? I am thinking my husbands family would love this cake. Oh what a lovely roll! I need a piece! Thank you friend, I’d love to have a slice with you, with a cup of hot tea:-)..
Looks amazing! My hubby loves sweets but doesn’t like tiramisu as well! He says it doesn’t have enough sweetness for him! He he…. Olechka, Haha, I’m SOO glad to hear that, I could never understand why he just didn’t care for it, lol.. Give this a try, it’s a great alternative. ????????.. Oh wow. Looks amazing… Can I just use cream cheese instead of mascarpone? I don’t really care for it.. Can’t wait to try this..
Vivianna, you sure can!!!! Btw. Absolutely love your name.. ???????? This cake roll recipe looks so good. I will definitely give it a try. What do you think if I put toasted chopped hazel nuts inside the roll? Will it ruin the authentic taste of the cake? Thanks! Your decorations look beautiful. Larisa, Thank you so much:). I hope you do try it.. Hhhmmm, I like the idea of the hazelnut but if you do that, I’d probably leave out the berries and maybe use ganache as decor with hazelnut. You can try it though, maybe it would taste fantastic:). Have a wonderful weekend.